The aim of this study was to determine how size, age, somatic and reproductive condition, abundance and egg production of southern calamary spawning aggregations changed during the spawning season in each of 2 years. During the spawning period in at least one of the years there was a decline as much as 20% in average size, 50% in somatic condition, 28–34% in size-at-age, 26–29% in reproductive status, as well as abundance and reproductive output of the stock declining during the spawning season. However, this change was not a function of the population becoming reproductively exhausted, as the aggregation was composed of different individuals with different biological characteristics. In each month the average age of individuals was ca. 6 mo, indicating that squid that had hatched at different times had entered the spawning aggregations, suggesting that the aggregation was made-up of a succession of microcohorts. Currently, management of many squid populations assumes that there is a single cohort in the aggregation. Therefore, estimating stock biomass at the start of the spawning season cannot be used as the population is constantly changing as micro-cohorts move into the aggregation. 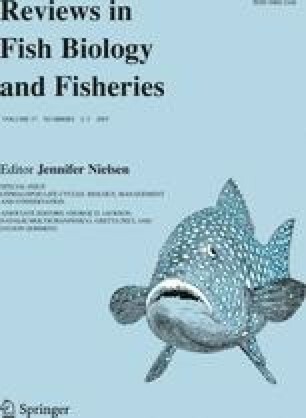 An instantaneous estimate of the spawning biomass, independent of fishing activity may be obtained by quantifying the density of deposited eggs. The strategy of individuals with a diversity of life history characteristics coming together in a single spawning aggregation may ensure the phenotypic and genetic diversity required to guarantee successful recruitment of this short-lived species. Therefore, temporally structured protection from harvest throughout the spawning season will ensure maintenance of this population diversity. This research was funded by a Fisheries Research and Development Corporation Grant (2000/121) awarded to NAM. We would like to thank the fishers for their co-operation in this study and those people who assisted in the fieldwork, in particular M. Steer, S. Tracey, and S. Willcox. The tagging work was funded by the Tasmanian Aquaculture and Fisheries Institute and logistic support was provided by the crew of the RV Challenger.